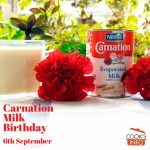 Carnation Evaporated Milk first rolled off the production line in Kent, Washington State, USA on this day, 6th September, in 1899. 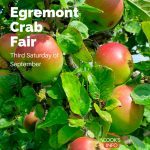 The Egremont Crab Fair is a fair held since 1267 in the town of Egremont to celebrate the Crab Apple harvest. The fair is held on the third Saturday of September. 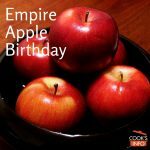 Not every apple is so lucky as to have its own official birthday, but the Empire Apple does. It was developed in Geneva, New York (the Empire State) over two decades of selective breeding. 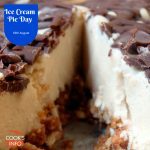 If you're in the northern hemisphere, your summer's almost over, and time's running out to sit outside in the nice weather and just enjoy a slice of Ice Cream Pie. Why not treat a friend to an Ice Cream Pie today. 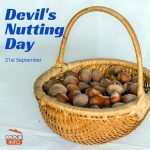 The 21st of September is traditionally the day to go off in the woods and gather fall nuts. It also afforded an occasion for teenage boys and girls to do a whole different sort of nutting. 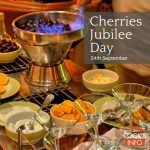 The 24th of September is Cherries Jubilee Day. Who really invented Cherries Jubilee, and when? There are conflicting tales, but today, you can read all about it right here, and decide what you believe. 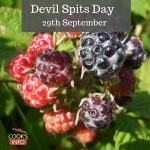 On the night of the 29th of September, the Devil is said to spit on blackberries. Some versions of the tale say it's to curse them because when he was kicked out of heaven, he landed in a prickly patch of blackberries.